Now that I’m back in the blogging world I’ve been catching up on all the great posts that I’ve missed over the past few months from My Blog List (full list in the right hand sidebar of the page). Great UK based blogs such as Monevator, A Grain of Salt, Simple Living in Suffolk and UK Value Investor. This post from ermine at Simple Living has however made me think about my cyclically adjusted PE (PE10 or CAPE) strategy and whether it is the right thing to be doing. I am a big believer in the Keep It Simple Stupid (KISS) principle and if somebody like ermine can’t understand what I’m up to then have I made it all too complicated? Let me try and explain my strategy in a different way to my original explanation. I am in the camp that believes that markets are not perfectly efficient and will at times Price the market incorrectly. One only has to think of the dot-com bubble for evidence of that. So at times prices will be too high and at other times prices will be too low. If you buy when prices are low then over a long period it is not unreasonable to expect you should get some out performance against a constant asset allocation and if you buy high then you could expect some under performance. Of course you need to be careful of the effects of dividends which have a big effect on performance to name but one complication. So how can you tell if the Price is too high or too low? One of the simplest methods that I know is the Price-Earnings ratio (PE). This is simply the Price of the stock/market divided by the Earnings per Share of the stock/market. This would be a great metric if booms/busts didn’t occur and company Earnings were always consistent. 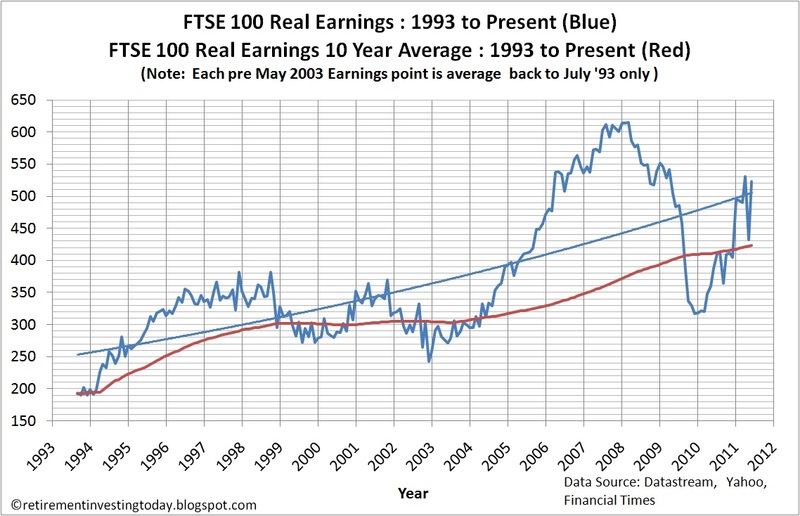 My second chart today shows a classic case of earnings not being consistent. Correcting for the devaluation of money through inflation (CPI in this case) we can see a lovely business cycle in the blue line where Earnings in 2003 were at a low rising to a peak in 2008 before falling to a low in 2010. From trough to peak earnings more than doubled. Therefore if the divisor in your PE ratio is moving that wildly what hope have you got trying to figure out if prices are too high or too low using a PE ratio? I’d say little to no chance. So I use the method developed by Robert Shiller and instead use an average of the 10 year earnings (corrected for CPI) to try and smooth out the Earnings divisor in the PE ratio. This is the red line in today’s second chart. I’m the first to agree that it’s not perfect but its a lot less susceptible to wild swings caused by economic cycles. So now that I have an inflation corrected 10 year earnings average for use as the divisor, which is relatively smooth, I can then calculate an inflation corrected Price and divide the two to give me a cyclically adjusted PE ratio (PE10 or CAPE). My investing strategy is then very simple. If the CAPE is higher than the long run average I want to hold less of the share market index as it is “overvalued” and if it is lower than the long run average then I want to hold more as it is “undervalued”. This is the tactical part of my Retirement Investing Today strategy. 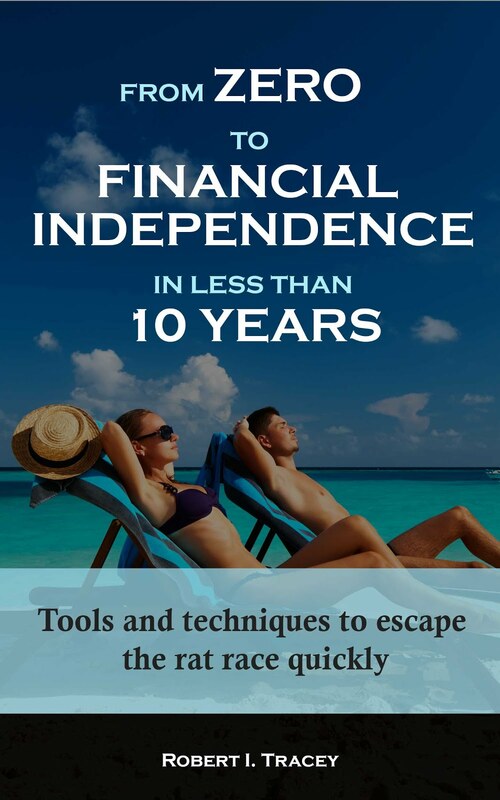 The rest of my strategy is simply a sensible asset allocation consisting of cash, bonds, equities (UK, Australia, International and Emerging), property and the yellow stuff (gold) with my allocation moving towards lower risk (cash, bonds) as I age. I’d love to hear other reader’s opinions. Does this seem sensible to you? What methods do you use? So that’s the theory. 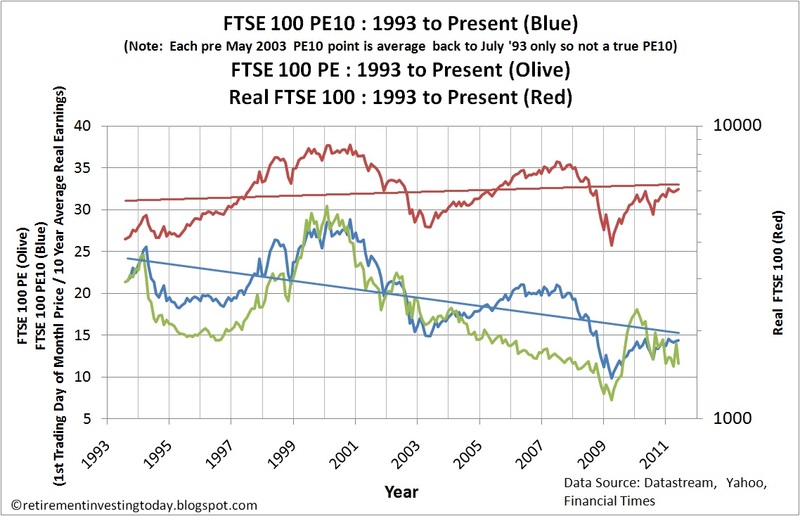 Where is the FTSE 100 cyclically adjusted PE (FTSE 100 CAPE) this month? At my last post back in December we were sitting at 13.9 against a long run average (well since 1993) of 19.7. Today’s first chart shows that as of the 01 May 2011 we had risen to 14.4 and if I take the FTSE 100 Price at the time of writing this post (6003.92) we are at 14.2. This is still well below the 20th Percentile for the dataset of 16.4 while the 80th Percentile is 23.5. 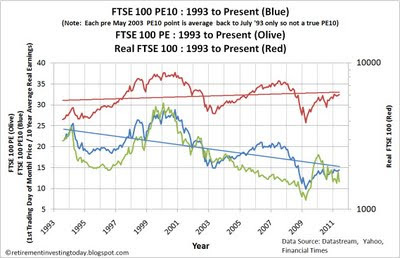 The correlation between the FTSE 100 PE10 and the Real (inflation adjusted by the CPI) FTSE 100 Price remains a strong 0.68. In comparison the standard PE ratio is sitting at 11.6. Finally I must point out that I am not yet using the FTSE 100 PE10 as a base for determining UK equity asset allocations and buy/sell decisions in my portfolio. This is because I believe that a dataset only going back to 1993 is not sufficient however over time as this dataset becomes more statistically significant I will at some stage switch to it. Today I am using the S&P 500 PE10 where I have data back to 1881 courtesy of Robert Shiller. Not perfect but I’m relying on the close correlation of Equity markets around the world. - - May 2011 price is the 01 May 2011 market close. - - UK CPI inflation data from April and May 2011 are estimated. I do find these presentations interesting and useful, and they form part of the background for informing investment decisions. The basic idea seems appealing, but is it reliable at different periods? Clearly, in early 2009 the CAPE was well below the average and that was a great time to buy. However, it seems difficult to examine other periods without knowing how the long term average itself changes. I expect over longer time intervals the system is more robust, but not all of us can wait that long. Your idea of using a longer reference period seems to underscore this point, but are such long term averages meaningful? They might be, but the world has changed a lot since 1881 and the underlying business parameters that applied then might not be valid now. I am not sure what to make of the falling trend line. Sorry to be a bit negative and I may have missed something obvious. Thanks for your thoughts. My thoughts on is it reliable at different periods? I'm not looking to trade based on values and am simply trying to squeeze some extra performance over the very long term. What makes me think it may work is the correlation between future real returns and the current CAPE. There seems to be something there but whether it's enough is the question. For example the ASX200 for my dataset has a -0.36 CAPE to 1 year future real return correlation. Are long term averages meaningful? I'm using them simply because I'm in it for the long haul as it's my retirement plan. I'm late 30's now meaning there is a very good chance that I will live for another 60's so feel long term is appropriate. - Lots of irrational exuberance around 2000 has skewed a small dataset. - Companies in the UK are in a permanent decline and so are priced as such. Thanks for being negative. I'm looking for all angles to try and become the best investor I can be. I'm all for lots of data points and follow your graphs with interest, but as you allude PE10 is not a perfect timing tool by any means. For one thing it's all down to calendar effects... PE10 currently has the dotcom crash (and plunging earnings) which will drop out soon. What if it was PE12 or PE7, etc? As a side note, I've been thinking that share buybacks could provide some strong support for what might seem like an unsustainable leap in earnings in recent times. US corporates are buying back like maniacs. Agree with everything you say. SalisGrano and I had a small comment exchange which seems to have disappeared in the recent Blogger meltdown. This included why was the PE10 trendline heading downwards. One of the key reasons as you mention was the irrational exuberance seen during the dotcom days combined with a fairly small dataset. Interesting point on the PE12 or PE7. I've stuck with the Shiller methodology (10 years) as my model for the S&P500, the AS200 and the FTSE100 to keep it consistent. I think you've just given me an idea for some future analysis though. The more I think about it that downward trendline on the FTSE100 PE is a really useful indicator of how abnormal the dotcom boom was. When I see bullish claims (as I have) backed up with remarks like "The FTSE is still below what it was 11 years ago" I'll try to remember it. I couldn't agree more. It really shows up on the S&P500 CAPE which I have just updated today here http://retirementinvestingtoday.blogspot.com/2011/05/s-500-cyclically-adjusted-pe-s-pe10-or.html where I have data tracking back to 1881 courtesy of Robert Shiller. In the US example the CAPE made it as high as 44.2 in December 1999 against a long run average since 1881 of 16.4. Now that is irrational exuberance. Compare that to the fun and games of The Great Depression where the CAPE "only" made it to 32.6 in September 1929. 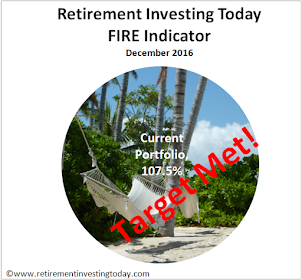 I have just run a simulation of my own Retirement Investing Today strategy in these times. If the S&P500 CAPE made to to 44.2 again my UK Equities allocation would have been reduced from a nominal 20.5% to 3.2%. My European Stocks form part of what I call my International Equity asset allocation which is today 39% European Equities, 39% US Equities and 20% Japan. As I mention in my posts for this allocation I use the fact that developed equities in the world are heavily correlated (Tim Hale's book Smarter Investing suggests it is about 0.9) and so set my tactical allocations based purely on the S&P500 CAPE. Not perfect I know. The actual calculations themselves are based on that of Robert Shiller. You can actually download his *.xls sheet here http://www.econ.yale.edu/~shiller/data.htm which will give you a template to start with. All you now have to do is somehow find the actual historic data which is the hard part. I haven't actually had a look for this data so can't help out unfortunately. As others have said, it's interesting to consider the factors that may generate long-term shifts in the CAPE - whether supply side (e.g. greater proportion of growth/tech companies in the index) or demand side (e.g. more money going into international equities). Quick question - are you able to share your data on FTSE100 earnings? Failing that, could you provide links to the sources you used? I'm trying to run some similar analysis on the UK myself.